How cool! Bianca has different colored eyes. She is like the David Bowie of cats. 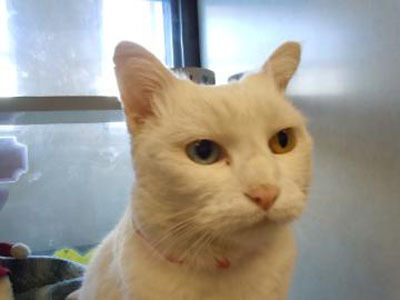 Bianca is a 5-year-old white cat who weighs 11.5 pounds. She has two different colored eyes, one blue and one yellow! This beautiful girl enjoys being petted and loves to have her fur coat brushed. She is a friendly, sweet girl who would love to be the only pet in the household. She would also prefer a home without young children because they make her nervous. Bianca has been at Lollypop Farm since December and has been Purrfectly Patient waiting for her new forever home. If you are interested in adopting Bianca, she is available for just $35. Bianca can’t wait to meet you and become a member of your family! Nikki, the dog from last week, is still waiting to be adopted. ooh looks like she's a Van cat descendant.